The Spotify playlist below plays in reverse order, bulding to my second favourite track of 2017. Unfortunately my favourite track 'Dreamy Journey' by Japanese three-piece The Peggies isn't on Spotify. So once that playlist is done hit play on the youtube video below. 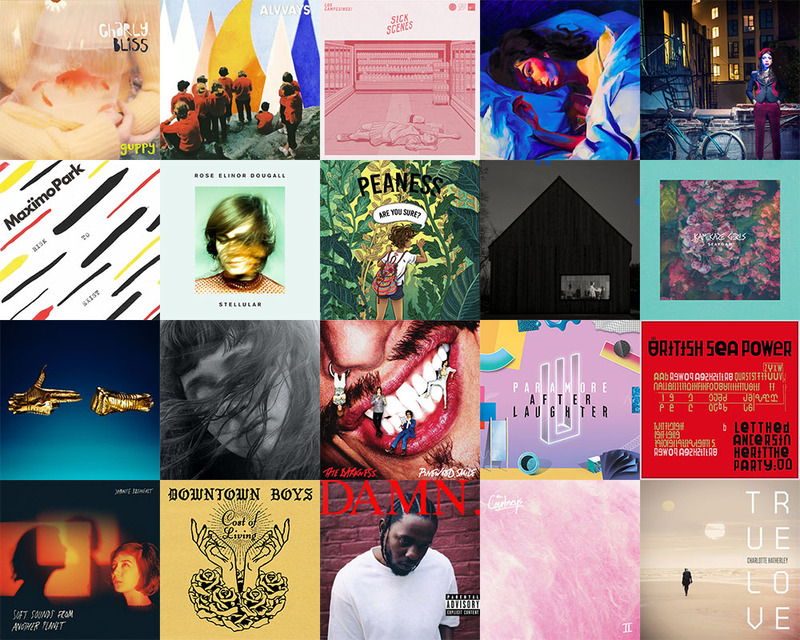 There's been a lot of amazing music this year, but I've manged to cut that down to a Top 40. Hopefully there's something new in there for you. Scroll down below the embeds for the full list. 31) Sad Suppers - Los Campesinos! Better late than not bothering at all. 2017 was a fucker. We all know it and saw it, so let's not dwell. We needed music and it provided. No mere hobby, but a balm, an instigator and the strength to keep pushing on. Without it... well, let's not even consider that. There's been no one trend or act that has made it's presence felt above any others but instead a constant stream of albums from different voices and perspectives. Whilst it's filtered though my inherently indiepop leanings I hope the below list reflects that more so than in past years. On her first album in nine years Charlotte Hatherley has ditched the guitar pop for which she's best known in favour of sci-fi inspired progressive synth pop. The change suits her. The elevator pitch would be “Tegan and Sara soundtracking Blade Runner”, but the sound is now Hatherley's own. Sounding as perfect at the height of summer as it does in the crisp snow The Courtneys second album is an under-the-radar treat of driven guitar pop. Whilst 'Lost Boys' is a personal highlight the opening half of this record is as good as most other runs of songs you're likely to have heard in 2017. 18) Kendrick Lamar – DAMN. I'm feeling less need to be contrary as I've got older, so have no qualms about including a record that's on literally ever other end of year list. Feel free to read those lists for insight. From my perspective this is simply a great, essential record that gets better and better with each listen. Cost Of Living is as vital as a punk album can get in 2017. With songs sung in both Spanish and English it highlights the importance of people like me just sitting back and listening for a change. Downtown Boys have something important to say so take note. (Also, sax in punk songs is one of the greatest ideas). A rich and immersive listen, Soft Sounds From Another Planet is the perfect album to curl up with after a long day. From gentle waltzes to more guitar driven fare Japanese Breakfast (aka Michelle Zauner) demonstrate an absolute mastery of everything she attempts. It's all the more impressive for arriving only a year after début album Psychopomp. It's becoming harder and harder to imagine what a fair and sane world would look like, but the one certainty is that in such a worlld British Sea Power would be recognised as national treasures. Let The Dancers Inherit The Party may not be their finest album, but on tracks such as 'Bad Bohemian' they can cut to my emotional core as well as they ever have. It took more than a couple of listens for After Laughter to sink in. Which is absurd for an album that's as obviously pop and apparently instantiations as anything ever recorded. I'm listening to After Laughter now as I write this and nearly every song sounds like a hit. I like it almost as much as I do their previous, self-titled, album. The novelty aspect of The Darkness wore off a long time ago, leaving us with a great rock band and amazing songs. Where their previous album found it difficult to live up to it's opening salvo Pinewood Smile is of a consistently high quality and their best overall since their debut. Go for the deluxe edition wich concludes with the awesome/daft 'Rock in Space'. Katie Crutchfield has been making a name for herself as one of the great indiepop stars of her generation, and on Out In The Storm has consolidated this into her most accessible collection of songs yet. Endlessly listenable, it's almost as good as future classic Ivy Tripp. I haven't seen this on many end-of-year lists, and can only assume it's as it had a digital release at the very end of last year. A Public Enemy for whatever we're calling this decade, RTJ3 is a blast of anger, a protest record, a triumph and vital listening for anyone hoping to survive these times. A two piece band from Leeds, Kamikaze Girls make the guitar and drums line up sound fresh and exciting again. They seem to have been active for a few years, but have only come to my attention recently and I'm glad they have. Seafoam has punk energy but some post-punk textures and makes for a satisfying and memorable listen. Trouble Will Find Me took a long while to sink in for me, so it was exciting that Sleep Well Beast was absorbing and brilliant from the off. 'The System Only Dreams In Total Darkness' is easily amongst the best singles The National have released and is only one the many high points of this record. I'm happy to go all-out and say that this may just be their best album since Alligator. 08) Peaness – Are You Sure? A three-piece band from Chester, Peaness released Are You Sure? as an EP on Alcopop! records this year. But as it's not only backed with some older recordings (taking it to a full-album length) but totally amazing it has more than earned a spot on my Albums of the Year list. Guitar pop that's this fun and smart is always worth celebrating and I can't wait to see where they go next. Rose was always my favourite member of The Pipettes so it's amazing to see that on her second solo album she's close to hitting the heights her former band did on their début album. That may undersell Stellular somewhat, as despite their classic pop perfection The Pipettes could never cover the range of styles that Dougall does here – from the Pulp-esque stop of 'Closer' to the dreampop 'Poison Ivy'. On their sixth album Maxïmo Park tackle the refugee crisis, far right press and feelings of hopelessness in a world that's more than a bit fucked. What could in lesser hands be obvious or sloganistic becomes an energetic riposte and their best album for a decade. On paper The Navigator falls loosely within a folk influenced indie template, but in reality covers a much wider range of styles and textures than I'm qualified to identify. The end result is a wonderfully evocative, lived in record that places the listener in the middle of a bustling, vibrant city. A future classic and pop perfection. It's all already been said about Melodrama. I loved it as much as everyone else and knew I would from the moment I heard 'Green Light' for the first time. Alvvays have very much ascended to my top tier of bands. Antisocialites picks up where their sublime début left off, supplying us with ten tracks of pop perfection. It's an eclectic record, with impeccable influences, that hangs together perfectly. I got old this year and saw Alvvays on my Birthday so can thank them for proving I'll never get too old for amazing indiepop. I'm not sure when I last heard a début album that was as fun packed, instantaneous and amazing as Guppy. Charly Bliss should surely be stars. There's hints of Weezer, The Strokes and Veruca Salt to this fun indie rock album but Charly Bliss are well on their way to claiming complete ownership of the sound. My Album of the Year is usually decided by what I can't help but keep coming back to, and in 2017 Guppy has proved more addictive than any other record. 1995 - The Radio Dept. The Light 3000 - Schneider TM vs Kpt. Michi. Gan. 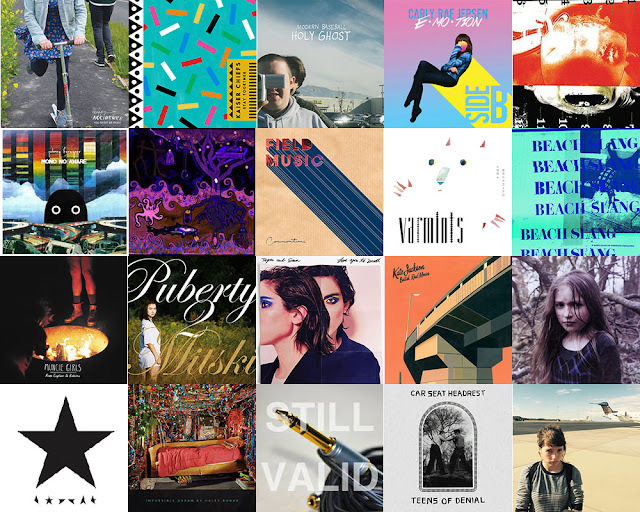 I struggle to say a lot about the music of the last 12 months. 2015 was another year where nothing much of anything really happened. I really like all of the below songs, in varying degrees and for different reasons. 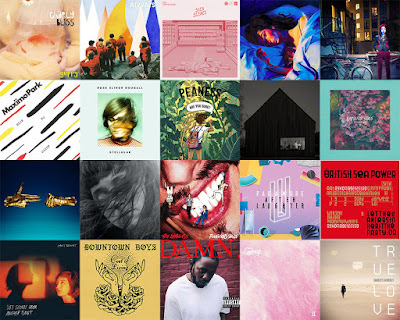 Some are singles from albums of 2014, but as far as I'm aware all were at least released in some form in 2015. There's a near complete Spotify playlist (missing Alvvays, Kitty and Taylor Swift) at the bottom for anyone interested. 44) Algiers – Irony. Utility. Pretext. 14) Ezra Furman – Can I Sleep In Your Brain? One of the highlights of this year's Halloween event at the Brudenell was solo artist Mitski, at what I believe was her first UK show. Unlike on record she performed with only an acoustic guitar, but still managed to lodge the chorus of 'Townie' in my head where it has stayed since. From this year's album Bury Me At Makeout Creek it's a wonky, a little noisy and utterly captivating. Playing just below headliners Metz at the aforementioned Brudenell gig was the fantastic Protomartyr. Where Metz were all noisy thrash (I didn't stay until the end), Protomartyr were all about post-punk tension, translating their records superbly to the live arena. I struggle to recall when I was last this impressed by a live performance of a band that I was largely unfamiliar with. 'The Devil In His Youth' as the opening track from The Agent Intellect is as good a place as any to start with them. I've not been able to turn the radio on this last few weeks without hearing the latest single from Field Music. In many ways it's the band career to date in a nutshell; hard to pin down, it starts off brilliantly before becoming more complex and even better as it goes along. The album (due in January) is going to be great. Preparing to go and see Los Campesinos! for the first time since around Romance Is Boring I got a little excited and decided to revisit their second record for the first time in what must be quite a few years. It was a timely reminder of its brilliance and by happy coincidence their set drew fairly heavily from the material, as did (for more feels) the latest issue of Phonogram which used quotes from WAB,WAD as well as The Long Blondes “Couples” for it's chapter headings. Aside from a charity shop purchased copy of C'mon, Low aren't really a band that I've spent any time listening to. 'What Part Of Me' came my way this month on a cover-mount CD that seemed to launch this year's End Of Year list deluge and simply sounds magical. It's minimal and Wintery with sublime vocal harmonies that I just want to sink into. It captivated me so much that I pretty much went straight out to purchase the album Ones And Sixes at a time when I'm really trying to do less of that.